Kathleen Lois Swensen, age 72, of Friendship, Wisconsin died Monday, September 10, 2018 at Villa Pines Living Center in Friendship, Wisconsin. Memorial services will be 1:00 p.m. on Sunday, September 16, 2018 at the United in Christ Lutheran Church in Dellwood, Wisconsin. Pastor Randal Walter Schoemann will officiate. Visitation will be Sunday, September 16th, 2018 from 12:30 p.m. until the time of service at the church. Kathleen was born December 29, 1945 in Chicago, Illinois to Theodore and Elizabeth (Petrik) Matthies. Kathleen graduated from Harrison high School in Chicago. She went on to work for many years as a secretary at Triner Scale in Chicago where she met her future husband Samuel Swensen. They were married on January 17, 1976 in Riverside, IL. Kathleen enjoyed solving crossword puzzles, playing board and card games but most of all she enjoyed good times with family and friends. 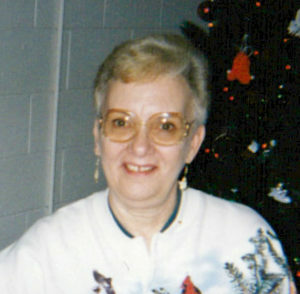 She was an active member of United in Christ Lutheran Church. Memorials may be directed in Kathleen’s memory to United in Christ Lutheran Church. Kathleen was preceded in death by her parents Theodore and Elizabeth Matthies and her husband Samuel Swensen. Kathleen is survived by her brothers Michael (Marcia) Matthies of Mundelein, IL and Charles Matthies of Downers Grove, IL; niece Deborah (Matthies) Schardt and nephew Michael Matthies; and many cousins and dear friends. Sorry for your lost,Kathy was fun to work with and a wonderful person to be around. So sorry to hear about Kathy’s passing. We grew up together in Chicago & shared many happy times! You & your family are in our prayers & thoughts! My mother, Kathy’s Aunt Kay, loved to get together with Kathy and Betty to play cards and enjoy wonderful snacks, friendship and laughter. Our deepest condolences to Mike, Chuck and the family. Kathy is in good company in heaven and will be missed by those who loved her here on earth. Our thoughts and prayers are with you. Kathy is my husbands cousin. He passed away two years ago. I know he was waiting in heaven to give her a hug and a hard time like he did whenever we got together with the Chicago cousins. We’ll miss you KATHY. Kathy is my husband’s cousin, we will miss her so much, she was always smiling, such a great personality. Always had a great time with Kathy. Rest in Peace Kathy, you will always be in our hearts. So sorry for the loss Kathy was a fun loving person. Sending prayers and sympathy to Kathy’s family. She enjoyed life to the fullest. Very dedicated to her church a Christian. Now she is with her Savior. I will truly miss Kathy! Especially at Thanksgiving. I remember when my son Ryan was very young Kathy would take one of his Hot Wheels car and put it in her pocket. When Ryan would finally catch on they would laugh like crazy! Kathy was a wonderful woman and a great bridge partner. I will miss my friend Kathy.